For the album by Walter Davis Jr., see Davis Cup (album). 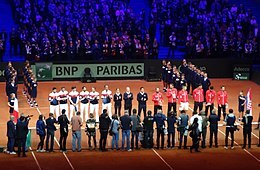 The Davis Cup is the premier international team event in men's tennis. It is run by the International Tennis Federation (ITF) and is contested annually between teams from competing countries in a knock-out format. It is described by the organisers as the "World Cup of Tennis", and the winners are referred to as the World Champion team. The competition began in 1900 as a challenge between Great Britain and the United States. By 2016, 135 nations entered teams into the competition. The most successful countries over the history of the tournament are the United States (winning 32 tournaments and finishing as runners-up 29 times) and Australia (winning 28 times, including four occasions with New Zealand as Australasia, and finishing as runners-up 19 times). The present champions are Croatia, who beat France to win their second title in 2018. The women's equivalent of the Davis Cup is the Fed Cup. Australia, the Czech Republic, and the United States are the only countries to have held both Davis Cup and Fed Cup titles in the same year. The Hopman Cup, a third competition for mixed teams, carries less prestige, but is a popular curtain raiser to the tennis season. Only the Czechs have won all three competitions in one calendar year, doing so in 2012. The idea for a tournament pitting the best British and Americans in competition against one another was probably first conceived by James Dwight, the first president of the U.S. National Lawn Tennis Association when it formed in 1881. Desperate to assess the development of American players against the renowned British champions, he worked tirelessly to engage British officials in a properly sanctioned match, but failed to do so. He nevertheless tried to entice top international (particularly British) talent to the U.S. and sanctioned semi-official tours of the top American players to Great Britain. Diplomatic relations between Great Britain and the United Stated on the tennis front had strengthened such that, by the mid 1890s, reciprocal tours were staged annually between players of the two nations, and an ensuing friendship between American William Larned and Irishman Harold Mahony spurred efforts to formalize an official team competition between the two nations. International competitions had been staged for some time before the first Davis Cup match in 1900. From 1892, England and Ireland had been competing in an annual national-team-based competition, similar to what would become the standard Davis Cup format, mixing single and doubles matches, and in 1895 England played against France in a national team competition. During Larned's tour of the British Isles in 1896, where he competed in several tournaments including the Wimbledon Championships, he was also a spectator for the annual England vs. Ireland match. He returned to exclaim that Britain had agreed to send a group of three to the US the following summer, which would represent the first British lawn tennis "team" to compete in the U.S. Coincidentally, some weeks before Larned left for his British tour, the idea for an international competition was discussed also between leading figures in American lawn tennis - one of whom was tennis journalist E.P. Fischer - at a tournament in Niagara-on-the-Lake, Ontario. Dwight F. Davis was in attendance at this tournament, and was thought to have got wind of the idea as it was discussed in the tournament's popular magazine, and Davis's name was mentioned as someone who might 'do something for the game … put up some big prize, or cup'. Larned and Fischer met on several occasions that summer and discussed the idea of an international match to be held in Chicago the following summer, pitting six of the best British players against six of the best Americans, in a mixture of singles and doubles matches. This was discussed openly in two articles in the Chicago Tribune, but did not come to fruition. Nevertheless, the following summer, Great Britain - though not under the official auspices of the Lawn Tennis Association - sent three of its best players to compete in several US tournaments. Their relative poor performances convinced Dwight and other leading officials and figures in American lawn tennis that the time was right for a properly sanctioned international competition. This was to be staged in Newcastle in July 1898, but the event never took place as the Americans could not field a sufficiently strong team. A reciprocal tour to the U.S. in 1899 amounted to just a single British player travelling overseas, as many of the players were involved in overseas armed conflicts. It was at this juncture, in the summer of 1899, that four members of the Harvard University tennis team - Dwight Davis included - travelled across the States to challenge the best west-coast talent, and upon his return, it apparently occurred to Davis that if teams representing regions could arouse such great feelings, then why wouldn't a tennis event that pitted national teams in competition be just as successful. He approached James Dwight with the idea, which was tentatively agreed, and he ordered an appropriate sterling silver punchbowl trophy from Shreve, Crump & Low, purchasing it from his own funds for about $1,000. They in turn commissioned a classically styled design from William B. Durgin's of Concord, New Hampshire, crafted by the Englishman Rowland Rhodes. Beyond donating a trophy for the competition, however, Davis's involvement in the incipient development of the tournament that came to bear his name was negligible, yet a persistent myth has emerged that Davis devised both the idea for an international tennis competition and its format of mixing singles and doubles matches. Research has shown this to be a myth, similar in its exaggeration of a single individual's efforts within a highly complex long-term development to the myths of William Webb Ellis and Abner Doubleday, who have both been wrongly credited with inventing rugby and baseball, respectively. Davis nevertheless went on to become a prominent politician in the United States in the 1920s, serving as US Secretary of War from 1925 to 1929 and as Governor-General of the Philippines from 1929 to 1932. In 2018, the ITF voted to change the format of the competition from 2019 onwards, changing it to an 18-team event to happen at the end of the season, with 71% of ITF member federations voting in favour of the change. The new format, backed by footballer Gerard Pique and Japanese businessman Hiroshi Mikitani, was likened to a world cup of tennis and was designed to be more attractive to sponsors and broadcasters. Opposing federations included those from Australia, Germany, and Great Britain. Support for the reform was also mixed among current and former players, with some such as Novak Djokovic and Rafael Nadal being in favour of the new format, but others such as Rod Laver, Lucas Pouille and Roger Federer being opposed. ^ "Andy Murray wins Davis Cup for Great Britain - BBC Sport". BBC Sport. ^ Gillmeister, Heiner (1998). Tennis: A Cultural History. New York: New York University Press. pp. 213–214. ISBN 978-0-8147-3121-5. ^ Eaves, Simon J.; Lake, Robert J. (2016). "The 'Ubiquitous Apostle of International Play', Wilberforce Vaughan Eaves: The Forgotten Internationalist of Lawn Tennis". The International Journal of the History of Sport. 33 (16): 1963–1981. doi:10.1080/09523367.2017.1295957. ^ Lake, Robert J. (2015). A Social History of Tennis in Britain. London: Routledge. pp. 70–71. ISBN 978-0-415-68430-9. ^ Gillmeister, Heiner (1998). Tennis: A Cultural History. New York: New York University Press. p. 258. ISBN 978-0-8147-3121-5. ^ "Tennis of Two Nations". Chicago Tribune: 10. 3 September 1896. ^ "Tennis from Far Shores". Chicago Tribune: 8. 28 September 1896. ^ "American Players Abroad". American Lawn Tennis: 89. 27 April 1898. ^ John Grasso (September 2011). Davis Cup. Historical Dictionary of Tennis. Scarecrow Press. p. 79. ISBN 9780810874909. Retrieved 8 December 2011. ^ "Davis Cup Grows by a Third". daviscup.com. Retrieved 5 December 2010. ^ Eaves, Simon J.; Lake, Robert J. (2018). "Dwight Davis and the Foundation of the Davis Cup in Tennis: Just Another Doubleday Myth?". Journal of Sport History. 45 (1): 1–23 – via Project MUSE. ^ "History – Davis Cup - Pro Tournaments - News and Events - Tennis Australia". Tennis Australia. Retrieved 2018-03-07. ^ "Davis Cup set for fifth set tiebreak in 2016". ^ "Davis Cup reform: Nations vote for 18-team season-ending event". BBC Sport. 16 August 2018. Retrieved 17 August 2018. ^ Bodo, Peter (16 August 2018). "Here's everything you need to know about the massive Davis Cup overhaul". ESPN. Retrieved 17 August 2018. ^ "Tennis greats tear into Davis Cup overhaul". news.com.au. 17 August 2018. Retrieved 17 August 2018. ^ Briggs, Simon (29 August 2018). "Davis Cup should not become the Pique Cup, warns Roger Federer". The Telegraph. Retrieved 30 August 2018. ^ 6,000 join Malmö Davis Cup protest. The Local 7 March 2009. ^ Crowd ban 'risks bolstering extremists' . The Local 7 March 2009. ^ "ITF revises Davis Cup dead rubber policy". DavisCup.com. Retrieved 6 March 2016. ^ "Davis Cup Rules & Regulations – 2012 (English)". Archived from the original on 20 November 2012. Retrieved 20 November 2012. ^ "Davis Cup Rules". Retrieved 20 September 2015. ^ a b c d e "History - Records". Davis Cup. Retrieved 4 February 2017. ^ "Nations Ranking". daviscup.com. International Tennis Federation.